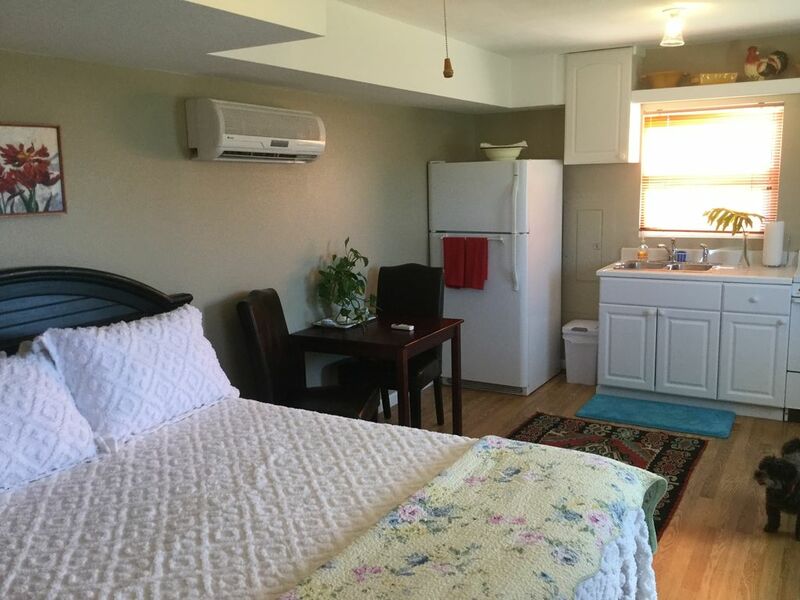 Southside ll, A newly remodeled, pond side studio - A short walk to the beach! Completely remodeled studio 200 fitbit steps away from the beautiful Carolina ocean. Large secluded yard for your children, pet/s (always welcome), outdoor games and barbecuing on our new grill overlooking the pond. Hatteras Village enjoys a little bit of everything for the beach lover: numerous wonderful restaurants, boutiques, lots of water sports as well as head boat and charter fishing, all within one and a half miles from the studio. Happy Belly Ice Cream and Kats Deli are a few yards away. A Hatteras native, we know all about our beautiful island and its lore. The pet fee is for 1 dog but please message me if you have questions about a 2nd pet. The rooms are literally across from the ocean and deli, beauty salon, jewelry store, gifts, and occasional live music. Hatters Village is wonderful for walking or bike riding. Fishing boats, seafood tours, and waterside restaurants are the norm. The property is where I grew up. This is all family land that we have had for generations. The property is just across the street from the ocean with a huge back yard. Only 2 houses are in the neighborhood and it is very quiet. We are very partial to our neighborhood. It is within steps of ocean, deli, ice cream and shopping. However, very quiet and private. The studio is located on the first floor with only 4 steps, very accessible. The yard has been a plus for all of our guests, they love the privacy as well as the pond out back. We are very proud of Hatteras Village. We have views of the Atlantic Ocean and Pamilco Sound. Views of the ocean and sound. We have views of the Atlantic Ocean and Pamlico Sound and are also on a pond. All linens and towels are furnished with no extra expenses . They are included. Completely equipted kitchen with pots, pans, dishes, glasses, etc. Large secluded lawn, , perfect for children, pets, games and an an outdoor grill. Great location and price for our beach weekend. Quiet and everything we needed for our stay. Thank you for the nice review. I do hope you will return. Let me start by saying that Wendy is wonderful and accommodating. She was always accessible when we had questions. And the house is a short walk to the beach. Which is convenient. The shower was warm, the stove worked nicely when cooking dinners, and the AC was good and cold. However, the mosquitos were intense. I couldn't comfortably walk out of the house w/o being swarmed. I'm pretty sensitive to them and get bit often. But even my boyfriend, who's normally not bothered by mosquitos, was annoyed. Walking to the beach wasn't possible. And I had to run to the car. The bed was also not what I'm used to and seemed rather noisy. I have a foam at home so it could just be it's been a while since I've laid on a spring mattress so I wasn't all that comfortable. In the end, we enjoyed our time at the beach and it was conveniently located. When we arrived, we couldn't find anyone at/near our rental. A neighbor or someone local who happened to drive by asked if she could help and directed us to a shop the owner owned. We found her in there, and she told us to go ahead up to the second floor of the first of the two buildings she owns. We brought all our luggage up only to realize it couldn't be the room we requested, as it did not match the picture. Walked back to the store, and she directed us to another unit. My husband opened the door only to find a woman sleeping there! We had to go back and forth to the owner sevearl times, and she didn't seem to know where we belonged. This took almost an hour of walking back and forth and trying different doors. We couldn't understand why she wouldn't just walk us to the correct unit. My husband was mortified to have walked in upon a sleeping woman! The unit was advertised to have television but the TV did not work. When we reported this to the owner, she directed US to call the cable company! My husband spent about an hour on the phone with the cable company, and they finally advised that we couldn't do anything since the account wasn't in our name. Why were we expected to call and handle this problem? We were shocked that we were expected to do this! It had been raining, off and on, all week, so in the evenings when it rained, we had nothing to do, as there was no working wifi or television, so we decided to go home a day early. Wendy told my husband, as we were leaving, that she would reimburse us for our last night that we didn't spend there, but we never received a dime. Quaint, effective suite for a relaxing get-a-way ! The accommodations suited our purpose for our first visit to Hatteras Island, Outer Banks. The area's amenities were ideal for what we wanted away from the extreme commercial tourists areas. Beaches were clean, the shopping pleasant, people friendly and a variety of quality (hometown) restaurants. The only thing the suite lacked was a comfortable recliner or stuffed chair and ottoman in lieu of the strait back chairs. Wendy was a great host and helpful whenever needed. Well Appointed, Clean, Nice Location! Wendy was incredibly responsive and helpful.This was a sweet space - perfectly appointed with everything you need. We would definitely stay again! Wonderful studio apartment. Clean and close to the beach. Apartment was clean and well maintained. It was across the road from the beach which was a definite plus. Wendy was very nice and answered any questions we had. We would stay here again. Pet Fee for 1 dog.